Make sure to reserve your seat in Clayton Whites Hotel on Friday, 14th December for what promises to be a most engaging event. Booking early is advised as this will be one of the highlights in the Chamber events calendar. Time: 1pm – 3pm (Registration from 12.30pm); Main Course served at 1.15pm. 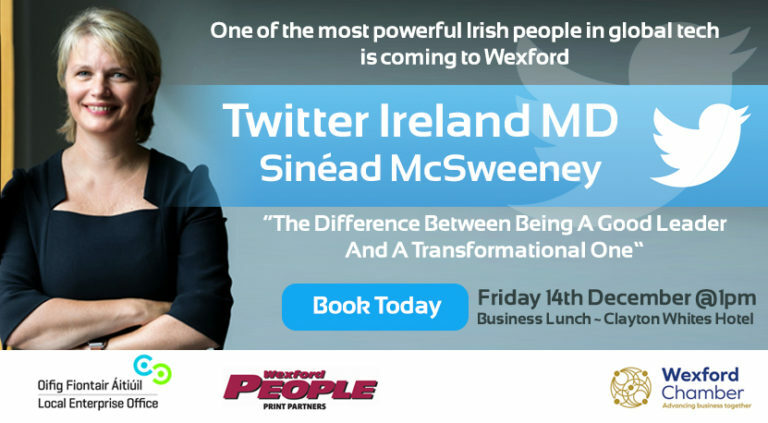 TICKETS: Pre-registration is essential – Tickets are available online from www.wexfordchamber.ie/shop, by emailing denisefarrell@wexfordchamber.ie or by contacting Wexford Chamber on 053 9122226.